On the seventeenth of this month [January], we commemorate the pious emperor Theodosius the Great. For you O Theodosius towards salvation. 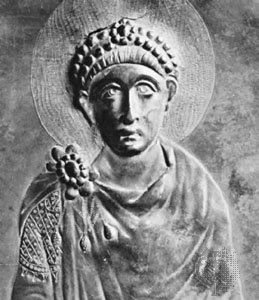 The most-pious and renowned emperor Theodosius the Great was born in Spain, illustrious according to his family, and notable in his courage. Having been made commander of the army by the Emperor of the West Gratian, son of Valentinian, he was crowned Emperor of the East by the same emperor in Sirmium, on the sixteenth of January in the year 379, and excelled very much the other emperors in goodness. However he was somewhat prone to anger, and this is evident from the many unjust executions and killings that he ordered in Thessaloniki because of the murder of Butheric. He repeated the same act in Antioch, due to the destruction of the statue of Empress Flaccilla his wife, who is celebrated on the fourteenth of September. However, he was corrected for the first by Saint Ambrose, Bishop of Milan, when he prevented him from entering the church, and he gave him a penance, which he was compelled to receive, and he also enacted a law that those who were sentenced to death should not be immediately condemned, but only after thirty days to allow for leniency. For the second he was corrected by Patriarch Flavian of Antioch through his intercessions, as well as many of the ascetics of Antioch, as Chrysostom testifies in his discourse On the Statues, and Nikephoros Kallistos brilliantly elaborates. Such extreme repentance did the renowned one show, that he was made worthy to also perform miracles. 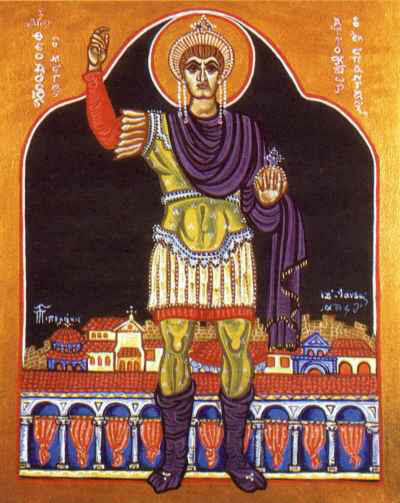 This is confirmed in the history of Kedrenos, who says that this emperor wished to go on a pilgrimage to the Holy Land and venerate the holy places in Jerusalem, and he went dressed as a common citizen. Entering the Church of the Holy Resurrection, he knocked on the door. After a servant opened for him, he entered. And - O the wonder! - at a time when all the lamps were unlit, they immediately all lit up, as if it was a festival. The servant was astounded by this wonder, and he reported it to the Patriarch. Through prayer the Patriarch recognized who he was and he blessed him. This emperor was successful in the following: First, in his days the Holy and Second Ecumenical Synod gathered in the year 381, which proclaimed the Holy Spirit to be God, and this was followed by the perfect theological interpretation of the consubstantiality (homoousion) of the Trinity. Second, in his days there were men who were most-wise and most-holy in both the East and the West. Third, he was a strong adversary against heretics and idolaters. Fourth, he had beautiful children. And fifth, he was a Saint. By his own hand this emperor copied the entire Holy Gospel, and he read from it daily. He reigned for seventeen years (sixteen according to some), and at the age of fifty he departed to the Lord in Milan, on the seventeenth of January in the year 395. He left his son Arcadius to be the emperor of the East, and Honorius the emperor of the West. His relic was brought to Constantinople and buried. The sacred Augustine says that this emperor would often say, that he rejoiced more over the fact that he was a member of the Church of God than being the ruler of the earth.